USPC would like to highlight the National Youth Board Members for the current term. Today we meet Area 7 member Julie Jacobs. 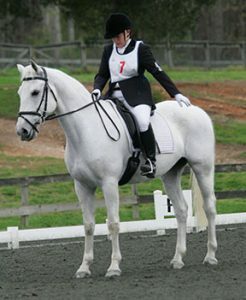 Julie Jacobs is an H Traditional, C-3 Dressage member of Greenville Foothills Pony Club in the Carolina Region. She started riding in 2004 and has been a member of Pony Club since 2007. Julie primarily competes in dressage and has attended Dressage Championships in 2014 and 2015. She is also passionate about horse management and enjoys teaching Pony Club members, as well as attending regional rallies as a Stable Manager. From 2009-2011, Julie attended Quiz Championships, twice as a competitor and once as a volunteer. In addition, she was a member of the 2013 National Youth Congress. She hopes to achieve her A-Dressage certification, and would like to continue to participate in Pony Club as a Horsemaster and National Examiner. Outside of Pony Club, Julie is a graduate of the University of South Carolina with degrees in math and biology. She works in a research laboratory at the USC School of Medicine studying treatments for cardiovascular disease. Julie plans to return to school to study for her master’s degree.